Because not everyone has the time to schedule regular mani sessions. 1. Use a cotton swab to wipe down your nails with white vinegar before applying basecoat. This removes any product buildup or natural oils on your nail beds that could create a barrier between the polish. Once your nails dry, apply basecoat. 2. Don't soak nails before painting them. Nail technicians do this to soften cuticles, but it causes nails to retain water and expand. Once they're painted they'll shrink, meaning your polish will no longer fit your nails. So ask the technician to use cuticle oil instead. 3. File your nails into a shape that mirrors your cuticle's, which makes them less likely to break. 4. Avoid getting any polish on your cuticles, which lifts the paint from the nail and leads to chipping. Don't cut your cuticles, but you can push them back using cuticle oil and an orange stick or a pusher tool to prevent paint from getting on them. 5. Use a sticky basecoat to make the polish last longer. 6. Apply two coats of basecoat to the tips of your nails. 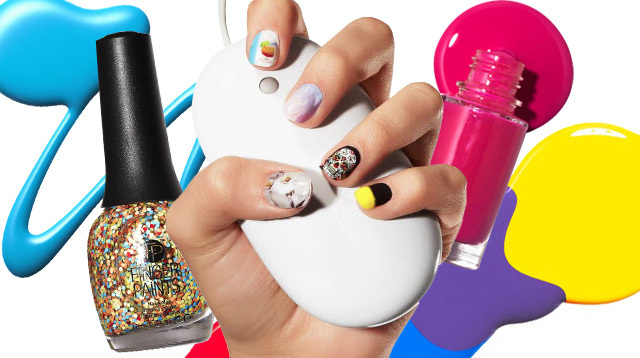 Nail tips are more prone to chipping (see: typing, texting, etc.). Apply another layer of basecoat to the top half of your nails for extra polish resilience. 7. Instead of shaking your polish up and down, roll it between your hands to eradicate and prevent air bubbles. If you paint air bubbles onto your nails, they'll chip faster. 8. Don't skip the "free edge" of your nails. Run the basecoat, paint, and topcoat around the edge to ensure your entire nail is sealed. 9. Dry nails with cool air. Hot air keep the polish from drying so use your blow dryer on its cool setting or a fan. Dipping fingertips in ice water for a minute or two also aids drying. 10. Reapply a layer of clear topcoat every two to three days to prevent chipping and enhance shine. 11. Wash your hands with mild soap instead of using hand sanitizer, which dries out your nails and ruins topcoat. 12. Apply nail oil daily to prevent your nails from drying out and splitting. The less moisture your nails and cuticles have, the more likely they are to break and tear. 13. If your nail polish has started chipping, file your tips down and seal them with another layer of topcoat. 14. Hide a gel manicure that has grown out by covering the base of your nails with glitter, creating an ombrè effect. The best way to distract from a chipped or overgrown manicure is, well, glitter. It's pretty and will last for what feels like *~FoReVeR~*. 15. If the tips of your nails have chipped, add super-thin French tip. Now you're chipping no more and have a cool updated look. 16. Wear gloves when doing the dishes to protect your manicure. The fastest way to ruin a manicure is to submerge your nails in hot water and harsh cleaning chemicals. So if you needed an excuse not to do the dishes, there you go. 17. If you chip or smudge a nail, smooth the polish ridge with a cotton swap dipped in polish remover. Otherwise if you just paint over it without smoothing it out, you'll get a bumpy nail.